Convert WAV audio files to MP3,M4A,AIFF,FLAC,WavPack,AAC,WMA,OGG,AC3,AMR,MP2,AU. 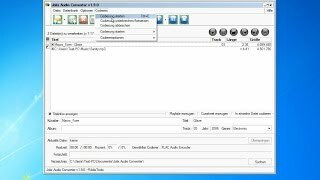 Free Convert WAV To MP3 is listed in Audio Convertors category and made available by 4dots Software for Windows. Unfortunately, we have not yet reviewed Free Convert WAV To MP3. If you would like to submit a review of this software, we encourage you to submit us something! What is Free Convert WAV To MP3 software from 4dots Software, what is it used for and how to use it? Free Convert WAV To MP3 is a free advanced tool that allows you to easily convert WAV audio files to MP3 and also to convert WAV to M4A, WAV to AIFF, WAV to WavPack, WAV to AAC, WAV to FLAC, WAV to WMA, WAV to OGG, WAV to AC3, WAV to AMR, WAV to MP2 and WAV to AU. Free Convert WAV To MP3 is very to use. Simply add the WAV files to convert, select the target audio format and quality profile and then press the "Convert" button. The new version has bug fixes and supports converting to WavPack. Also it is now multilingual and translated into 38 different languages. WAV input files can also be added by a simple drag and drop from Windows Explorer. Includes WAV cutter and WAV joiner. The conversion process can be paused or stopped. The input WAV files can be played by an in-built media player and also it is easy to check the conversion result by playing the converted MP3 audio files. To speed up the conversion process or in order to save computer resources the user can set the Free Convert WAV To MP3's thread priority. The user can also edit the output profile settings such as bitrate, sampling rate, volume control, encode mode, vbr quality and metadata. You can import playlists and also normalize the volume of the output and apply fade in and fade out effects on the audio files. Supported Input Format : WAV. Supported Output Formats : MP3, M4A, AIFF, AAC, FLAC, WavPack, WMA, OGG, AC3, AMR, MP2, AU. Download and install Free Convert WAV To MP3 safely and without concerns. Free Convert WAV To MP3 is a software product developed by 4dots Software and it is listed in Audio category under Audio Convertors. Free Convert WAV To MP3 is a free software product and it is fully functional for an unlimited time although there may be other versions of this software product. You can run Free Convert WAV To MP3 on all modern Windows OS operating systems. Free Convert WAV To MP3 was last time updated on 14.09.2014 and it has 2,333 downloads on Download.hr portal. Download and install Free Convert WAV To MP3 safely and without concerns. What do you think about Free Convert WAV To MP3? Download.hr periodically updates software information of Free Convert WAV To MP3 from the software publisher (4dots Software), but some information may be slightly out-of-date or incorrect. Free Convert WAV To MP3 version 3.1 for Windows was listed on Download.hr on 14.09.2014 and it is marked as Freeware. All software products that you can find on Download.hr, including Free Convert WAV To MP3, are either free, freeware, shareware, full version, trial, demo or open-source. You can't download any crack or serial number for Free Convert WAV To MP3 on Download.hr. Every software that you are able to download on our site is freely downloadable and 100% legal. There is no crack, serial number, keygen, hack or activation key for Free Convert WAV To MP3 present here nor we support any illegal way of software activation. If you like software product please consider supporting the author and buying product. If you can not afford to buy product consider the use of alternative free products. Is it safe to download and install Free Convert WAV To MP3? Free Convert WAV To MP3 was checked for possible viruses by various leading antivirus software products and it is proven to be 100% clean and safe. Although, no malware, spyware or other malicious threats was found we strongly advise you to check product again before installing it on your PC. Please note that laws concerning the use of Free Convert WAV To MP3 may vary from country to country. Please be sure that you are using Free Convert WAV To MP3 in accordance with the law in your country. How to uninstall Free Convert WAV To MP3? How do I uninstall Free Convert WAV To MP3 in Windows Vista / Windows 7 / Windows 8 / Windows 10 OS? Make sure the "Free Convert WAV To MP3" is highlighted and then make right click, and select Uninstall/Change. How do I uninstall Free Convert WAV To MP3 in Windows XP? Make sure the "Free Convert WAV To MP3" is highlighted, then click "Remove/Uninstall." How do I uninstall Free Convert WAV To MP3 in Windows 95, 98, Me, NT, 2000? Select "Free Convert WAV To MP3" and right click, then select Uninstall/Change.